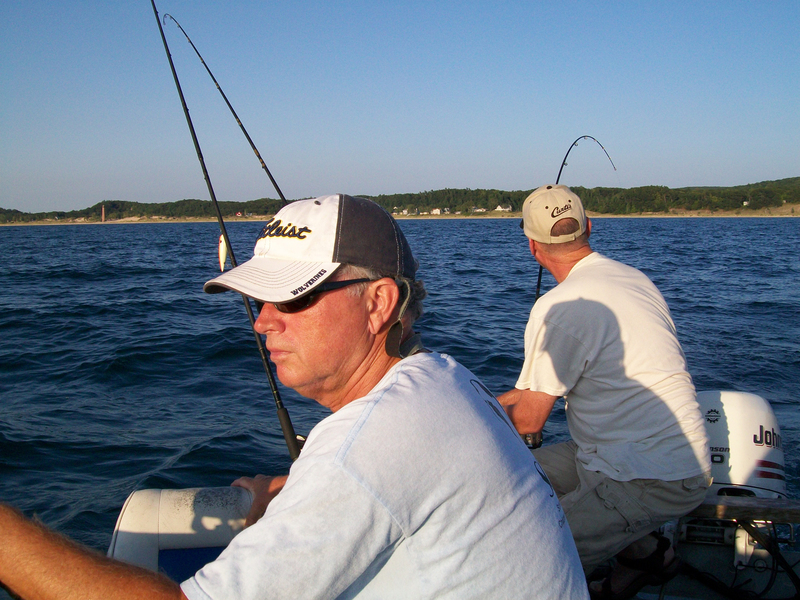 My bother-in-law Bill DeJong and I met up with his friend Larry Byl last night for a quick excursion on Lake Michigan. Larry has a home on the lake and a very amazing set-up. He trailers a 16 foot deep-v right on the beach and uses a winch hooked to a post to back the trailer in and out of the water. The boat is set up with rod holders and down riggers, dipsy divers, and planer boards. It took just a few minutes to launch and once underway another fifteen minutes for Larry to put out six lines. Bill drove the boat while I watched Larry pay out line and adjust the various rods. Every inch of the boat is utilized and three guys would be about the limit. Lake Michigan was choppy and I couldn’t help but wonder if it would get worse. The sun was dropping to the horizon and I could see Little Sable Point Light House in the distance. While I was taking it all in, we had the first strike. Larry grabbed the pole and handed it to me. 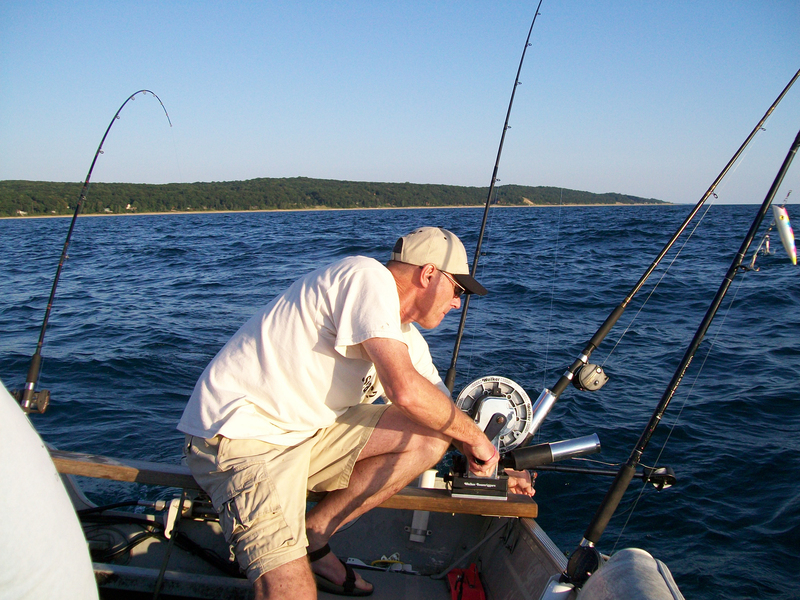 I have done a lot of fishing so I’m no stranger to the drill, but Salmon on Lake Michigan is another animal. (I normally fish inland lakes and small trout streams.) It felt like a motorized anchor on the end of the line – I reeled line in, it pulled line out. I finally got it up to the boat and Larry netted it. A King Salmon with a glittering body that would make my wife’s polished silver look tarnished. A spectacular fish. My first impression: 30 lbs. Larry’s impression: 18 lbs. I guess I go with Larry’s impression. Bill was next. We had moved offshore about a mile and a quarter when the drag on one of the planer board poles started zinging. The fish was way out there and Bill had his hands full. He worked the pole and reel by dipping the rod while he reeled like a madman but it still took maybe eight minutes to get the fish near the boat. The fish made a run to the starboard side and Larry got concerned about the other lines. The fish went port side and Bill thought for a moment he was off but then felt the fish surge again. I caught a glimpse of the fish as he rolled on the surface – a giant head was all I saw. All of a sudden he was gone. I felt bad for Bill partly because I had an idea of how much energy it took to get the fish that far. Larry, seeing Bill’s disappointment, tried to take out the sting by saying how he (Larry) should have pulled in a line that got in the way. My own history tells me that even when you do everything perfect you lose fish. It’s the one that got away and every good angler has a story. 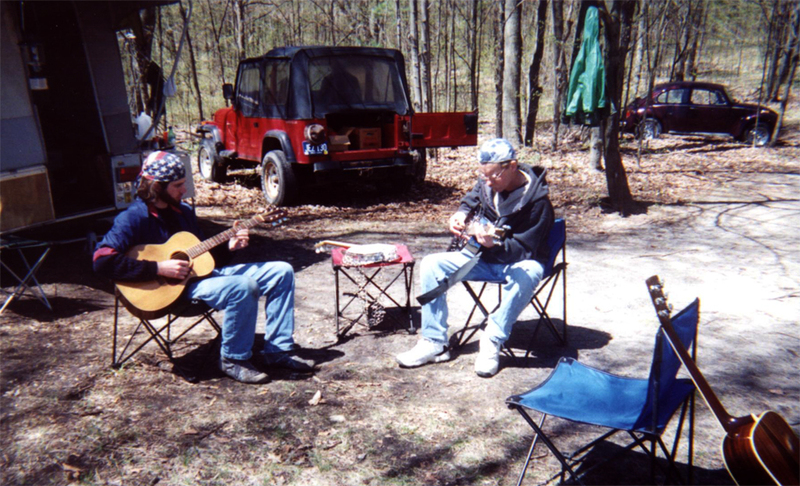 We had a slow stretch then and when I say slow it was maybe fifteen minutes before the rods started dancing. I saw Larry grab the starboard planer board pole but he said the fish was on and off. Meanwhile the pole right next to it started up and he handed that one to Bill. 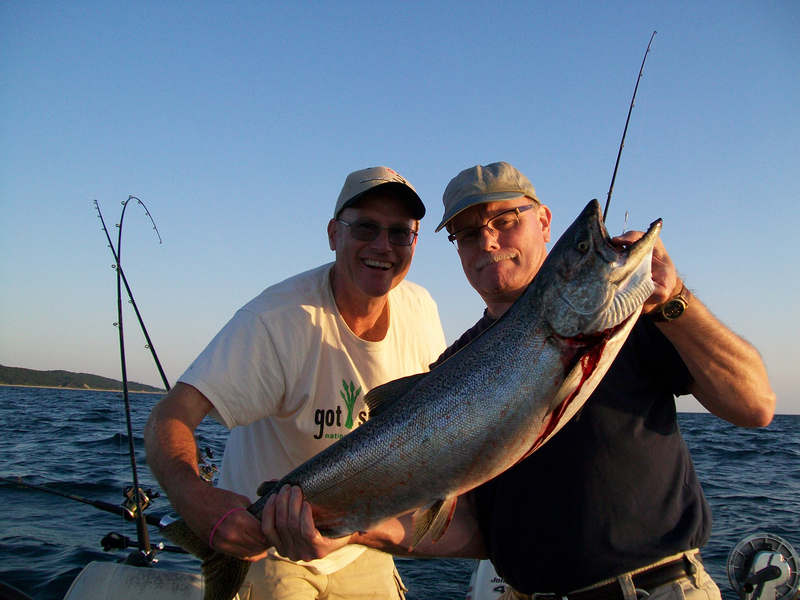 This fish came in quite a bit easier and Larry netted the small but fat Coho. A beautiful fish. By now the sun had set but strangely it was still light out. Might be some sort of big lake phenomenon. Larry pulled in lines and readied the boat for the trip home. We cruised nearer to shore for the ride back and I tried to get a photo of the lighthouse. It is still a working light house though built in the 1870’s. It was too dark to get a good shot. We pulled the boat back up on the beach using Larry’s trailer and winch system and Larry was kind enough to do a quick filet job on the salmon. He has a knife that would scare a samurai warrior. A couple minutes and we had some boneless filets washed, bagged, and ready for the grill. 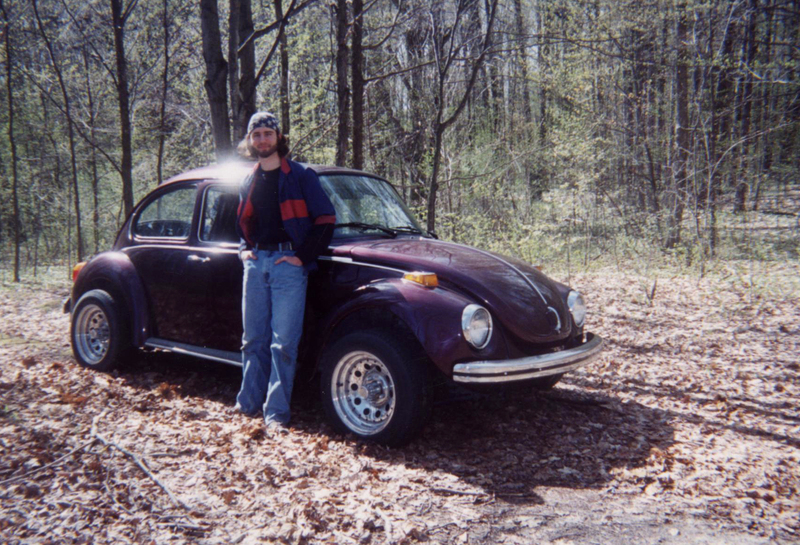 I tried to thank Larry for the great adventure but he shrugged it off like guys tend to do. What a night. 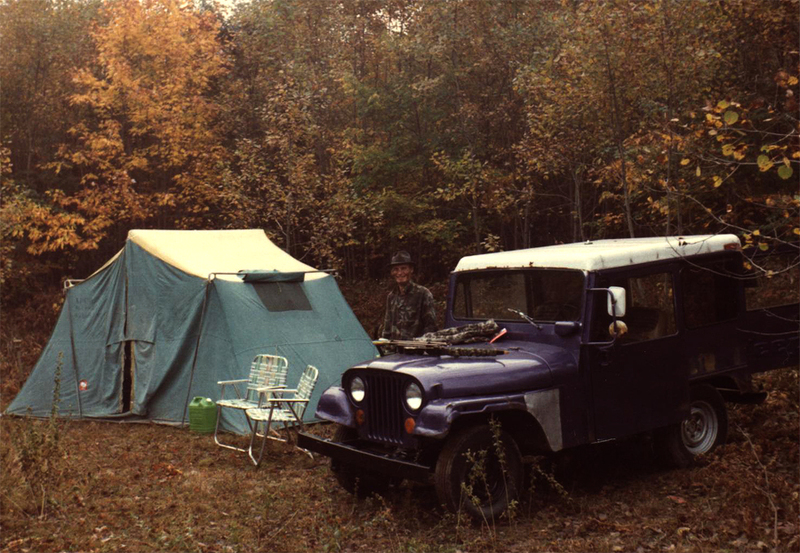 Find a guy with a big SUV – something that will hold his and your fishing and camping gear. 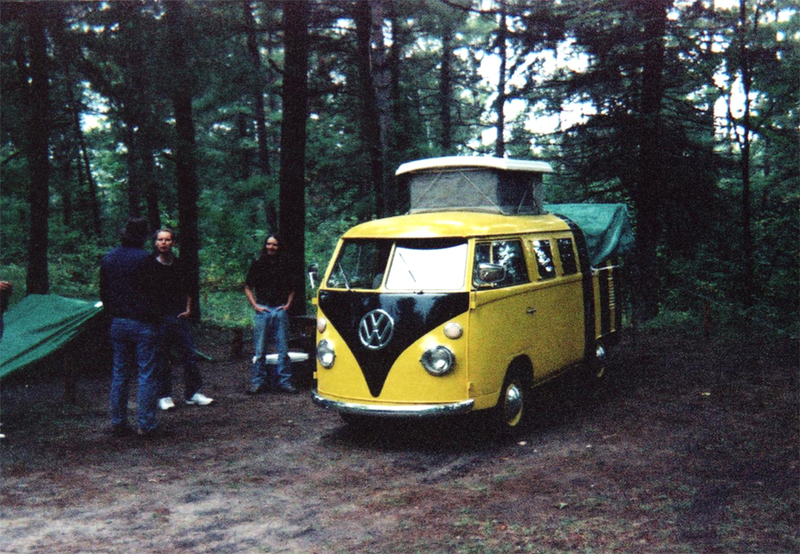 Conversely, make sure you own a small gas getter that is impractical for camping. Take out the passenger seat if he starts talking about using your car. You can always say the bolts rusted off. He must be taller than you. I’ll have to work on the reasons but that’s my gut feeling. It helps if your fishing buddy is honest since he won’t be able to lie about the fish he caught. Nothing more aggravating than telling a whopper and having your buddy tell a bigger one. In fact, make sure he’s not a good story teller – that’s your job. If he is insecure that is a bonus since he will likely want to please everyone, including you. He’ll probably show up with cold drinks, sub sandwiches and even some granola bars for when you’re on the stream. Thank him of course, but don’t feel guilty because you’d be playing right into his hands. Make sure he can filet fish because you never really got the hang of it and sure hate to waste good meat. Also, make sure he has some decent camp cookware and a camp stove in case you want a trout dinner cooked by a master chef (him). If he has a nice boat add ten points. If he can launch it by himself add five more. Make sure he doesn’t own a dog. If you’re OK with dogs you might be able to work around this until his dog has your number. When a dog figures out every time you show up he gets left behind it can get pretty ugly. If your potential fishing buddy has a hot wife that can cook, add two points. Try to find someone with a sense of humor because there’s nothing funny about fishing. Fishing is the original anti-hysterical activity. You want someone that can say something off the wall after four hours of mind-numbing biteless ozone fishing. One funny comment can mean the difference between a forgettable trip and an unforgettable trip. Based on all of the above – I may be the best fishing buddy ever! I’ll have to ask Feral. Heading west on 10 out of Baldwin I asked Feral to keep an eye out for any sign of the Baldwin River since we would be driving directly over it – but alas, there was no sign of the river. Michigan has been in a drought for most of the summer and after this weekend I can report something new about this phenomenon. 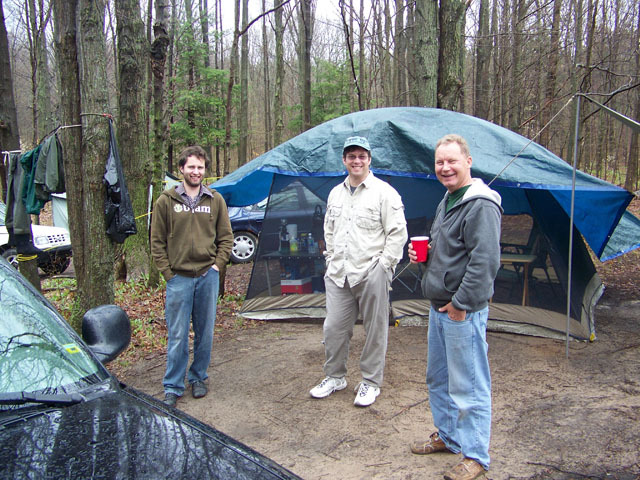 We camped at Big Leverentz and it started raining while we were out on the lake (fishing for bass and pike). It rained for a good half hour. We could see the rain dapple the lake and we could feel a cooling of the atmosphere. There was a thick overcast blocking out the sun completely (a huge relief since we had been baking in the sun). Here’s where it gets interesting. We didn’t get wet. After half hour our clothes were still dry. When we pulled the boat back in for the evening – the camp was dry. It occurs to me this might make a good Twilight Zone episode. For added drama substitute desperate farmers for fishermen. 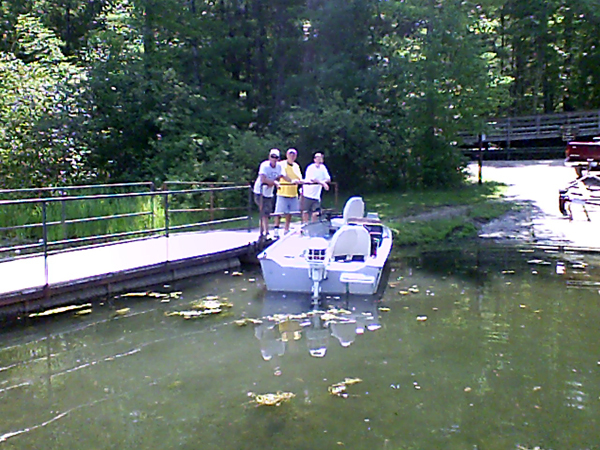 As usual the folks we met camping and fishing were friendly and three guys who waited patiently for Feral and I to launch the boat were treated to a comedy of boat launch errors and may they live by the adage that what happens in Baldwin stays in Baldwin. They were out for panfish and we understand they had around ten though I didn’t get a picture, except for a group photo as proof that they were at the lake. I apologize for the quality of the picture since it is so fuzzy it could be just about any three guys. If called to testify I’ll vouch they were at the lake if they vouch for my seaworthiness. In spite of the intense heat and murky lake with strange gunk floating about we did pretty good on the bass and caught one decent pike. Feral tossed a weedless mouse on the pads and had some action but mostly we fished power worms, culprits, and some top water baits late in the evening. Total bass for 2 days around 20 with a few three pounders. For those who know how hard that lake gets fished – I suspect we did alright. The bad news of course is we don’t eat bass. If we get a real rain maybe I can post something for trout fishermen and eat the proceeds.